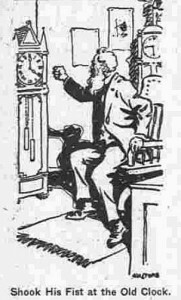 We found this Grandfather Clock story from an archive from 1913 called The Day Book which was published as a small tabloid in Chicago, IL. . We thought we would would include this in our archives. The old clockmaker was seated in his office, his head upon his hands, his elbows on his desk, pondering. He occupied a tiny office in an part of New York, downtown, and he had sat there for a great part of each day since he came to America fifty years before, bringing with him the skill of twelve generations of Swiss clockmakers. Walser’s clocks never varied by more than five minutes a year. Great, old fashioned grandfather clocks they were, and because the modern fashion is for cheap and gaudy things, he sold only to a few old fashioned customers, and his whole stock was stored in the small warehouse and workshop at the back of his office. But he had hoped to hand down the business to his successors yes, he had hoped that the tradition would not die, out with him- – And he had driven Ernst, his only son, his only child, out of his home forever. Ernst was the last of the Walsers, and with his action he had effectively cut himself off from all the generations that were to come. How foolish his quarrel has been! It was about a girl whom Ernst wanted to marry, and because he had not told his father all about it old Walser had taken umbrage. “Who is she?” he asked angrily? And Ernst answered that she was a domestic servant. Then the old man’s anger flared out, for the Walsers’ traced their descent from princes and Walser had mixed so little with his kind that the old traditions lingered. If he had been less angry and Ernst less proud he would have learned that Elsa was studying social science and had taken her position for reasons which certainly were no discredit to her. But the embittered old man was not in any mood to listen to reason, nor Ernst to explain. Old Walser turned to his son. He pointed to an old grandfather clock which had ticked away the hours minute by minute ever since he had brought” it to America. “Ernst,” he said hoarsely, “that grandfather clock was made by my father for his serene highness the prince of Lutterling. My father was once engaged to marry the prince’s daughter. She died, but the match was never considered unequal. The Walsers have been a proud old family though they were clockmakers. And you, you, you are going to marry a servant . “Well, marry her, but from this moment you are no longer a Walser. I disown you by the memory of my father.” He pointed still to the time- piece. “When that clock, which my father made in 1833, goes wrong by as much as ten minutes in a day, I will ask you to come back to me,” he said. “Now go!” And Ernst went. The old clock never varied by as much as a minute a day. Its melancholy tick was wearing the old man’s heart away. He moaned in his misery as he sat at his desk. How gladly he would have had his son back, servant wife and all! If only he had not been so hasty! A good boy, too Ernst had always been a good son to him. He had never thwarted or crossed him until that furious quarrel began. And now Ernst was starving in a garret in Washington Square — so much he had learned. And he was married to his servant wife. Their lives were abjectly miserable, for the boy was working as a shipping clerk for ten dollars a week! He swung round in his chair and shook his fist at the old grandfather clock. “You swine, you dog, you pig!” he shouted. “Can’t you go wrong just for this once, so that I can keep my word and ask my son to come back to me?” He swept his fingers across the glass, and the clock ticked heavily in answer. And then a wonderful thing happened. A sudden whirring sound was heard, and the hands began racing furiously round and round the old Roman figures that marked the face of the dial. Round and round they ran, once, twice, and now so fast that Walser could not distinguish anything except a blur. And then they stopped and the old grandfather clock stood at half past four. That was the precise time at which Ernst put on his hat and left the house. The old man fell back in his chair and stared in astonishment at this phenomenon. Presently, when curiosity overcame his terror, he opened the case and peered in. And swiftly enough the cause was revealed. Wedged tightly into the mechanism was a clockwork mouse. It must have laid for years unnoticed inside the case, Until it had been jarred down by the tapping of his fingers; its cogs had become entangled with the cogs of’ the mechanism and, happening to be wound up, the clockwork of the mouse had gone off, sending the hands flying round the dial till it ran down. Walser drew out the mouse and looked at it. It was a rusty ancient toy such as is retailed on the streets for a nickel, or perhaps a dime. Half of the tail was gone, and the beady eyes stared out of a battered and moldy face. Then the old man remembered. Years before he had. brought that mouse home for his son Ernst, in the days when he was a baby, playing about the floor of the nursery. The child must have placed his toy Inside the old clock end forgotten all about it. tangled with the cogs’ of the mechanism and happening to be wound up, the clockwork of the mouse had gone off, sending the hands flying round the dial till it ran down. Walser drew out the mouse and looked at it. It was a rusty ancient toy such as is retailed on the streets for a nickel, or perhaps a dime. Half of the tail was gone, and the beady eyes stared out of a battered and moldy face. Then the old man remembered. Years before he had brought that mouse home for his son Ernst, the days when he was a baby, playing about the floor of the nursery. The child must have placed his toy Inside the old clock end forgotten all about it. Walser rose up solemnly and put on his hat. He turned to the grandfather clock and his voice was choking with emotion. “I know now,” he said, “that this is a judgment and a miracle in one.” And he thought of his father, the old clockmaker, and how he had been wont to tell that the goods deeds which are done always bring results, even In other lives. He did not doubt that because his father had been an honest craftsman, his handiwork had borne witness to him for his own sake. Ten minutes later he got off a street car at Washington Square. He arrived at a dingy, shabby house, and scanning the list of names on the unpainted letter boxes, discovered that of his son. Walser made his way up to the top floor and knocked. A comely young woman came to the door. “You are ?” queried Walser. “I am Mrs. Walser,” she answered in a very sweet voice. “You have business with my husband?” “You are my son’s wife?” shouted the old man. “Why, I thought I thought!” And suddenly he flung his arms about her and drew her to him and kissed her. And at the audible sound Ernst came to the door, looking shabby and thin, -but with fire in his eye and fists doubled to repel this assault upon the sanctity of his home. Seeing his father he halted dead. “Come here, my boy,” cried the old man. “It’s all forgotten the grandfather clock ran down.